A few months ago, when Toulouse announced that Nike wouldn’t be renewing its contract with the French giants, rumours abounded that the US sports giant would be pulling out of rugby altogether, just over a decade on from their revolutionising of rugby shirt design back at the 2003 World Cup. Thankfully that seems to have been premature, and if the latest Sarries shirts are anything to go by, there’s still plenty of evolution left in the tank. Like the new Argentina alternate shirt we reviewed recently, this is an unabashedly modern design. 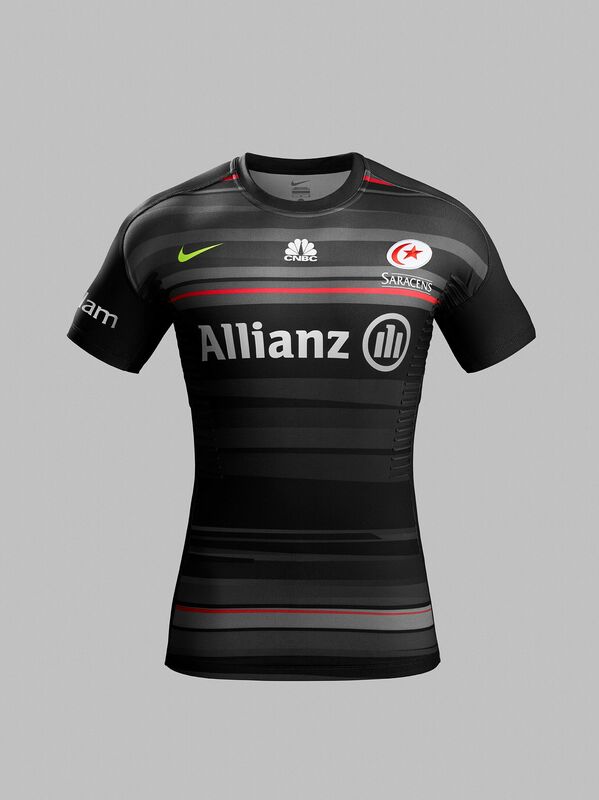 Saracens’ shirt design has been pretty fluid over the last few years, mixing up various amounts of red and black with stripes, panels and hoops. With such a blank canvass to work from then, it’s unsurprising that Nike has opted to go for perhaps its boldest design yet here. By mixing various shades of black and grey in a series of uneven stripes across the front of the shirt, mixed in with the smallest amount of red, it’s a very different look to what’s gone before. Whether you think this is ugly or not is very much a matter of taste, but we really dig it. One final touch we like is the swoosh, which is done in contrasting luminous yellow. Nike calls this colour ‘volt’, which we’re not nearly stupid enough to actually use, but we think it looks cool and modern all the same. As for the alternate shirt… well… we can’t quite make our minds up. Initially, we thought it was definitely the weaker of the two shirts, but the more we look at it, the more we seem to like it. There’s no doubt that the gray stripes, hoops, arrows and the like are much more overt on this design, which depending on whether you like the asymmetrical, ultra-modern pattern or not, will depend on whether this thing makes you run for the hills or get the credit card out. We actually think it’s pretty cool, although we’d have preferred to see a little more red used. 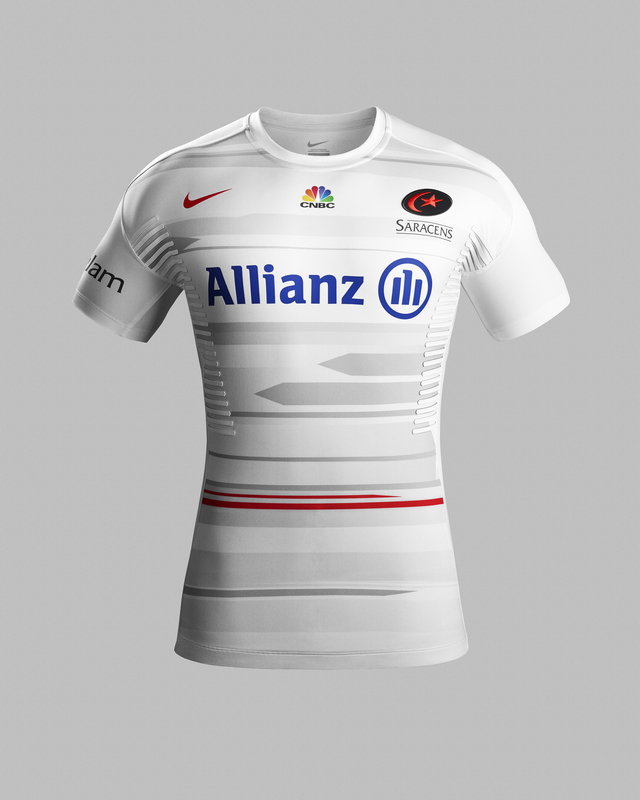 We’re not entirely sure why they opted to have the Allianz and CNBC sponsor logos in full colour – rendering them in black in the same way the home shirt did with white would have made the front of the jersey hang together much better – nothing to make your shirt look a little bit of a mess like a tiny rainbow peacock, is there? Nike revolutionised the modern rugby jersey back in 2003, and every other maker out there has followed that innovation, making shirts tighter and harder to grip. But Nike clearly haven’t been resting on their laurels, both of these shirts have elevated rubber grip panels on the ribcage that are, so says the press release, designed to secure the ball in contact and prevent it from being dislodged. As with all grippy things on rugby shirts, we’re slightly cynical about whether they actually do anything, but given that they’re so pronounced they look like they’ve come off a tractor tire, they look a bit more formidable than most.